Canon EF to Micro-4/3 mount Speed BoosterTM adapters designed exclusively for the Blackmagic Pocket Cinema Camera (BMPCC). Note that this new 0.58x Speed Boosters will only attach to BMPCC equipped with a Micro-4/3 mount. 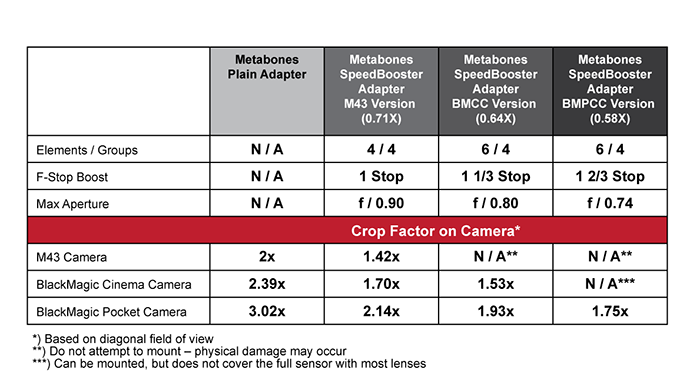 They cannot be attached to standard Micro 4/3 cameras (cannot be attached to GH4, GH3, GH2 and GH1 body). Box Dimensions (LxWxH): 4.4 x 4.3 x 2.3"